How to create an urban living space? How to change the world/your neighborhood? How to make the revolution? This film is about the New World Society, a citizens’ initiative in Tallinn, Estonia. The New World is an observational documentary. It follows the main characters and the dynamics of their revolution from the very beginning of it – four years ago. We see euphoria, passion, compromises, frustration, hurt feelings and broken hearts. It is the anatomy of one revolution. 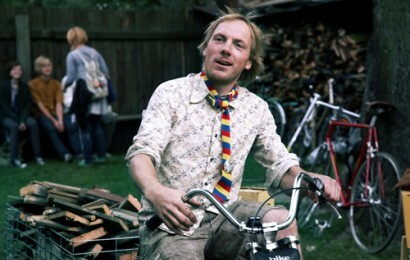 At the heart of the film is Erko, a man who wants to build a new society in which bikes replace cars and people come together to share art, culture and life stories. With a group of like-minded friends, he gleefully wages a campaign of civil disobedience (such as occupying a car park and filling it with bikes and flowers) against those who would fill society full of rules. When the chance comes to receive a grant to build a literal new world – a community centre just outside the centre of Tallinn – Erko and colleagues start to enjoy recognition from the city and others. But soon the pressure of filling in forms, dealing with permits & angry neighbours, and lack of donations sees Erko becoming increasingly agitated at having to ‘work’ for a living. Soon Erko is wondering whether the new world will fall foul of age old problems. Check on the vimeo channel the whole documentary with english subtitles.